a picture inspired by gary's (kiwiness) portrait entry last year. probably one of the best set-up portraits i've taken. window light only. Gorgerous shot! She is very Pretty! a stunningly beautiful image. i do feel that you've over smoothed her skin in spots though making it a little artificial. The reflection in her eye is truly exceptional. Your work is inspiring. Katrina is lovely. I like the hands in this shot and the areas that are out of focus. The wisps of hair to the right add a touch of feathery texture. The red scarf puts some richness to the image as well. Lovely lighting, Mannie!!! 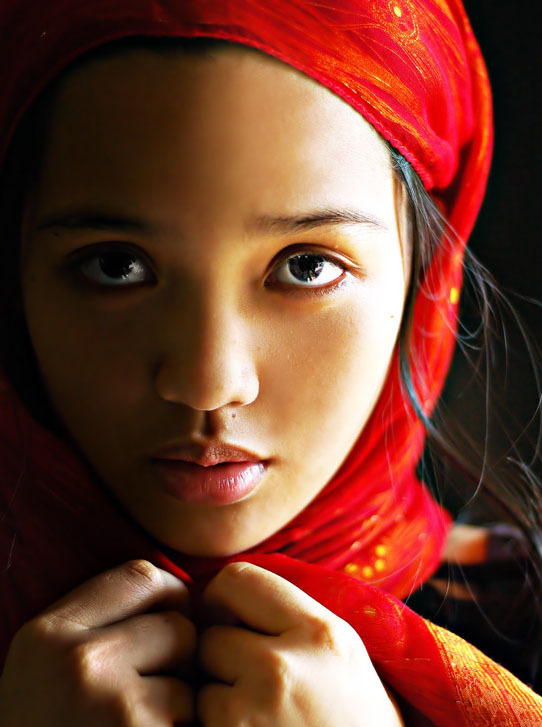 Love her eyes & expression, the lighting & the red scarf. Manny, this is absolutely terrible. It's terrible that you can produce some of the best portraits this site has ever seen, and do so consistently. Message edited by author 2005-03-20 03:12:04. Superb! Wondrous lighting! Natural, yet transcendence. Blessings to you and your god-daughter. This is absolutely gorgeous. Really, really nice job. truely, it's one of the best portraits i've ever seen. The expression is great. A few things that bother me are the light/shadow on her hands. the effect looks good on the face, but one hand in light and another in shadow somehow doens't look that good to me. Also the catch light in her eyes.. they are distributed and are on the periphery which looks kind of odd. ...and into the favorites it goes. Message edited by author 2005-03-16 10:37:18. Proudly hosted by Sargasso Networks. Current Server Time: 04/20/2019 09:06:43 PM EDT.